Modern agriculture must meet the multiple challenges of increased productivity to meet food needs of larger populations, profits to ensure food and welfare security and be more environmentally healthy. One way to meet such challenges are to apply concepts of site specific nutrient management. It has been well recognized that the application of adequate quantities of plant nutrients is a key to increasing maize productivity, economic return, and to reduce negative environment impact. At present, there are only general recommendations for maize fertilization, and application rates are often dictated by the fertilizer grades available in the market rather than by crop or soil needs. In addition, most existing fertilizer applicators were not adjustable. These practices led to the imbalanced, inefficient and environmentally unhealthy use of fertilizers, which is not only an economic loss to the farmers, but also a concern to the Government as most of the fertilizer materials are imported. Thai farmers apply fertilizer according to availability in the market and learning from successful neighbors. The philosophy behind precision agriculture or site specific nutrient management is that production inputs (seed, fertilizer, chemicals, etc.) should be precisely managed for the most economic production ( Searcy, 2003). In USA, Precision Agriculture often used the GIS and GPS as the devices to manage the farms in small areas within fields, which requires a high technology farm management systems (Davis et.al., 2003 ). For site-specific fertilizer recommendations, soil testing is an important tool. Soil testing as a tool for fertilizer recommendation is not widely practiced in Thailand due to the limited number of soil testing laboratories and lack of research on fertilizer recommendation. Furthermore, soil testing is time consuming, and costly for poor farmers. 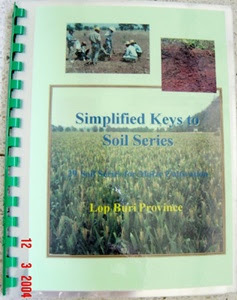 To help the farmers test the soil samples quickly, identify their soils and apply the right fertilizer recommendation are crucial steps for site specific nutrient management in Thailand. Moreover, farmers do not have ready access to information on soil and fertilizer, they do not know how to calculate the costs and they can be mis-informed and use the inappropriate organic and inorganic fertilizers. Therefore, there is an urgent need to adapt site-specific nutrient recommendations (primarily N, P, and K), to the farmer’s production goals and resources, which could then be transferred to the farmers by extension officers or farmer leaders. This purpose of study was therefore, to measure the acceptance of the farmers after using the developed soil test kit and fertilizer recommendation using the Thai database in developed decision-aids software. 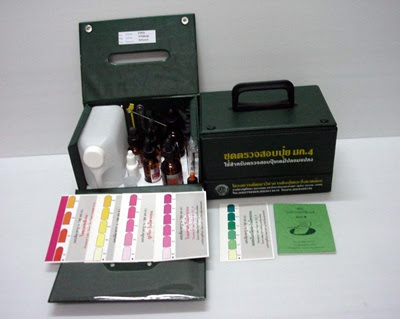 The idea behind the soil test kit development originated in a chemical fertilizer test kit invented 30 years ago that was very effective in removing fake fertilizers from Thailand fertilizer market. 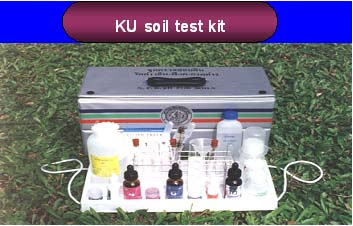 The kit was also used by researchers to identify an unknown fertilizers. The site specific fertilizer management approach includes soil testing by soil test kit, soil series identification and fertilizer recommendation from newly developed decision-aids software. All of these steps have already simplified to be used by the farmers. SimCorn- A software program( a decision-aid) was developed that implemented, in a user-friendly way, the two components of site-specific nutrient management (soil series identification in the field and the soil test kit analysis of farmers’ fields), together with algorithms to estimate fertilizer N, P and K requirements. There are three nutrient calculations algorithms embedded in the software, one each for nitrogen, phosphorus, and potassium. The N algorithm is based on the DSSAT 3.5 simulation model which has been adapted to accept soil test kit nitrate as the current N status of the field. The PDSS program based on a simple P algorithm was used for phosphate fertilizer prediction. Potassium fertilizer requirements are based on a Mitscherlich-Bray equation. These algorithms were implemented in both desktop and handheld computers in both Thai and English versions. Estimates of fertilizer N, P and K requirements seldom exactly match the existing blends of fertilizers. In recognition of this a blending algorithm was also implemented which calculates the amounts of existing N, P and K fertilizers that should be blended to provide the amounts of N, P and K required for the specific field. This software was first implemented on a handheld platform using a Palm operating system and then subsequently implemented on a desktop computer under a Windows XP operating system. The software is used by extension officers and other interested persons. The fertilizer recommendations generated by the algorithm were summarized in a fertilizer handbook and given to farmers of the respective province in Thailand. The field day at Saraburi and field day at Khon Kaen were organized for the farmer leaders to disseminate the technology to the other farmers. We found that capacity building of farmers and their institutions was essential for achieving a balance in economic, social and environmental development goals and to enhance sustainable rural development. Site-specific nutrient management for maize not only resulted in higher yield but also lower the cost of production (Attanandana et al., 1999, Attanandana and Yost 2003). The capacity building of farmer leaders through empowerment technique was successful. The results revealed a remarkable change and improvement in the farmers in terms of thinking and working.